Love your cozy look! I just picked up Lou & Grey leggings and totally know those joggers would be incredible! I want a pair of those jogger pants! I love cozy little things, my favorite kind of gifts to get! Your home is gorgeous too!! Rachael, that scarf is everything! I need one stat! Such an adorable lounge outfit, too. Have a fabulous weekend! Yes cozy is key these days. Love your scarf! Not only is the color beautiful but just looking at it, it looks warm. Perfect for the mornings when it's freezing! I hope you and family get better soon. Have a great weekend! Such cute and cozy pictures. I love how you decorated for Christmas! You are so cozy chic! Love that adorable scarf, and your home decor is perfect! I love your pictures, that scarf is so amazing I love it. SO many great picks too that long cardigan is calling my name! Oh sweatpants are so very warm and comfortable! I love to wear thema in the evening! You look so cozy! I love your holiday decor too! I think this i my favorite gift guide I've seen! I love all these picks and the best part is I know they would definitely get used! You look so comfortable! I love your pictures and outfit! You do look quite cozy in that outfit, with mug in hand and by your beautiful Christmas tree! I would be living in those sweatpants joggers, too! And, a cozy gift guide is the best idea. I think we all want cozy gifts this time of the year when it gets so cold! You look so cozy!! I want every thing on your list, especially because it is so cold today!! You look so good! Loving the cozy pieces. I want to stock up on a few cozy pieces myself soon. Your outfit looks so cute and cozy. These are great holiday gifts, too. Such a pretty outfit dear! Love your scarf and sweater combo. Simple, yet really cozy and comfy. Beautiful! That scary and sweater look so cozy and warm! Cozy gifts are my favorite to give and receive!! I love that scarf you are wearing! I LOVE your decorations. They are SO STUNNING. And that sweater looks beyond cozy and warm. Such a great round up of gifts! Love the cozy scarf and pajama set! Just bought this scarf in pink & love it! So cute on you! Your entire look is so warm and comfy looking! Perfect roundup of cozy options! Lou and Grey is the best! Love all your gift ideas! I would love to give or get any of them! I'd say you nailed it in the cozy department! 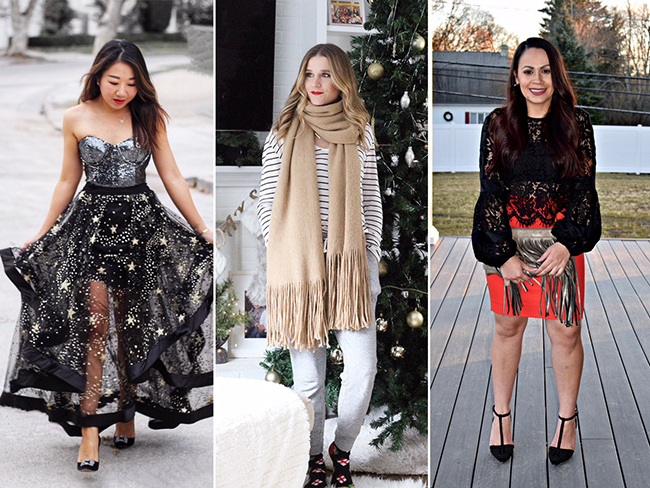 Thanks for linking up with us for Thursday Moda! For someone who seriously loves to be cozy, you're speaking my language! I kinda want all of these fun items for myself now! And can you send some of the snow my way? I'd love a surprise white Christmas! Loving this cozy winter look babe! That scarf looks too cozy! I like the camel color too! I'm all about being cozy all winter break long. You look so cute! I’m a sucker for anything cozy, I’m especially loving the joggers & that gorgeous scarf! 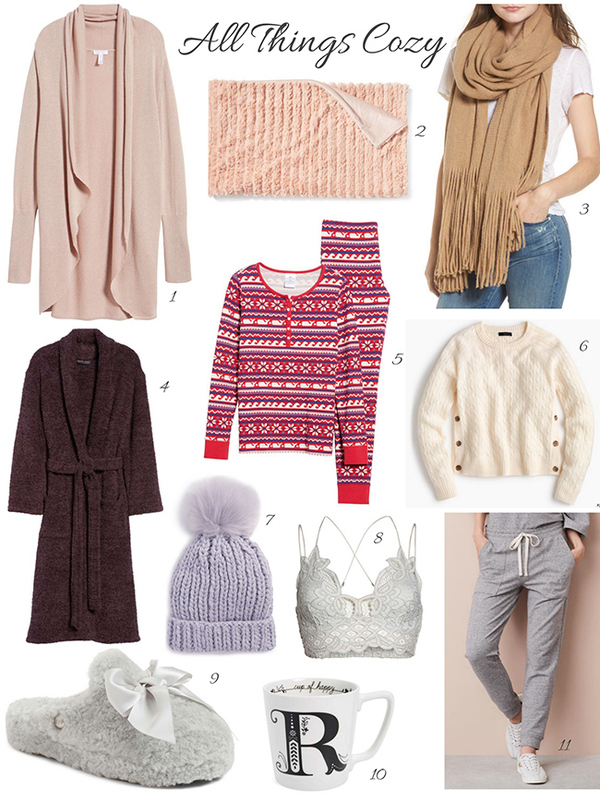 I am loving these cozy picks! That scarf looks amazing! Super obsessed with your scarf and those jogger pants. I've been looking for a pair like those!